Depend on the bags you need. 2) Size & Thickness: Customized, any size and thickness are available. 3) Printing: OEM are welcomed, it can be up to 10 colors with our automatic computerized high speed printing machine. 4)Style: The bag can be with tear notch, zip lock, and also with hang hole. Tear notch: Easy to open the bag. Zip Lock: Make the bag can be reclosable. Hang hole: Hang the bag on a hanger to save space. Capacity: We always make bags with size 70g, 100g,150g, 200g,250g, 500g 1000g for tea, coffee bean or coffee power package. Sometimes we can also make bags for our customers to package milk power. 2.We can produce various packaging bags & film roll as your requirements. we can also give some advice for your reference. 4. We can offer you samples to test before order. 2.Gravure printing up to 10 colors, bright and vivid printing , with hanged hole can be showed on display easy. 3.Multi-optional lamination for performance of high barriers against light, oxygen, moisture and puncturing. 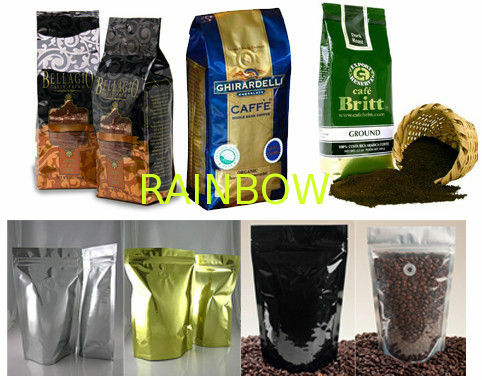 Rainbow Package Company is specialized in plastic flexible package. Its factory imported Sophisticated production facilities for flexible package and with procedure of 8-12 colors intaglio printing, laminating, cutting, bags making. We have latest high speed printing machine,laminated machine and all kinds of bag-making machine, Such as 3- sides sealed machine, 4 sides sealed with zipper bags type machine, stand up with zipper bags type machine etc.